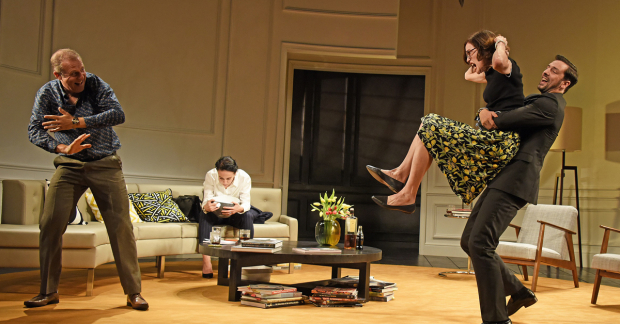 Bath Theatre Royal is on a roll, with the best summer season in years. The only one we didn’t book was The Ideal Husband, and that was because we had already seen it in London. 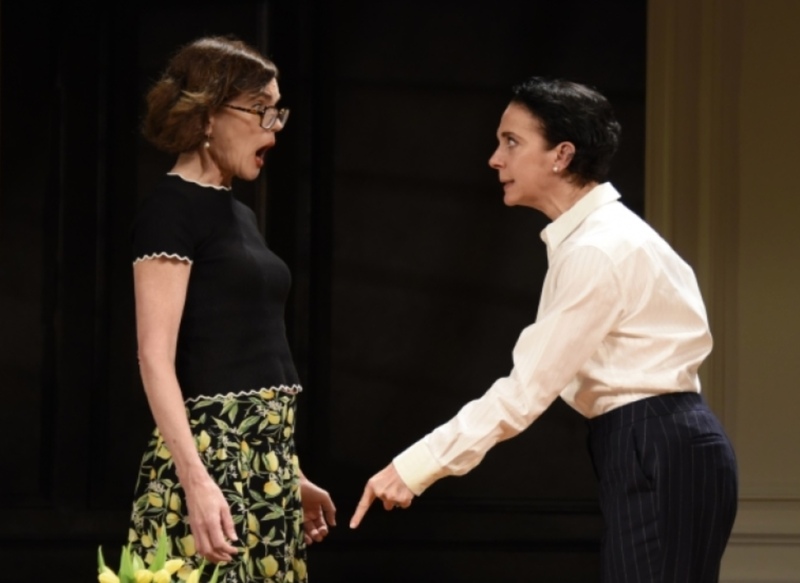 Elizabeth McGovern is the third Downton Abbey star in the last three Bath productions, so Cora Crawley follows Mr Bates in The Price and Mrs Hughes in Switzerland. 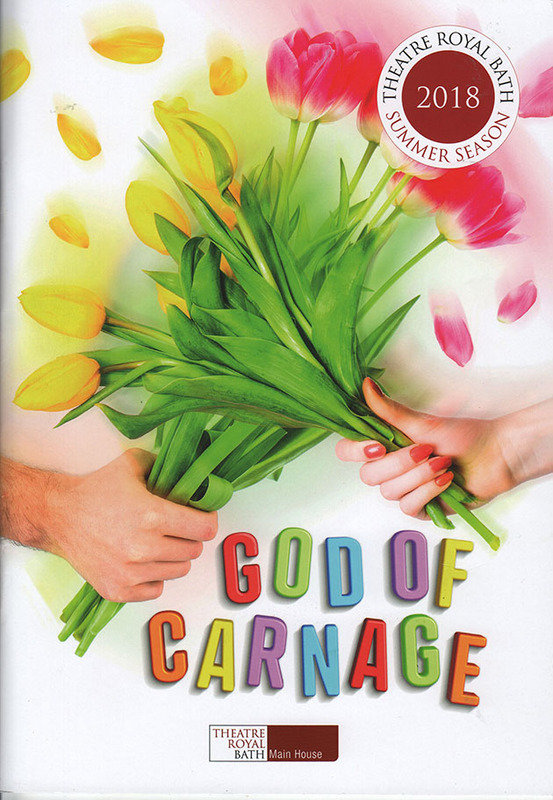 God of Carnage is highly adaptable. It was first written in French in 2006. The first performance was set in in Germany. The 2008 British version was set in London. Then the Broadway version switched it to Brooklyn at the request of James Gandolfini. The 2011 film version was back in New York. Here in 2018, we’re in London. It is universal. It works wherever with a change of name for the park where the kids’ fight took place. Christopher Hampton’s translation introduced more jokes and humour back in 2008, which apparently worried Yasmina Reza, as she also was concerned that the tragic element came across. However, translation is not just words and Hampton was right in that English speakers use more jokes in conversation than people in most other languages … and British speakers use more Americans. 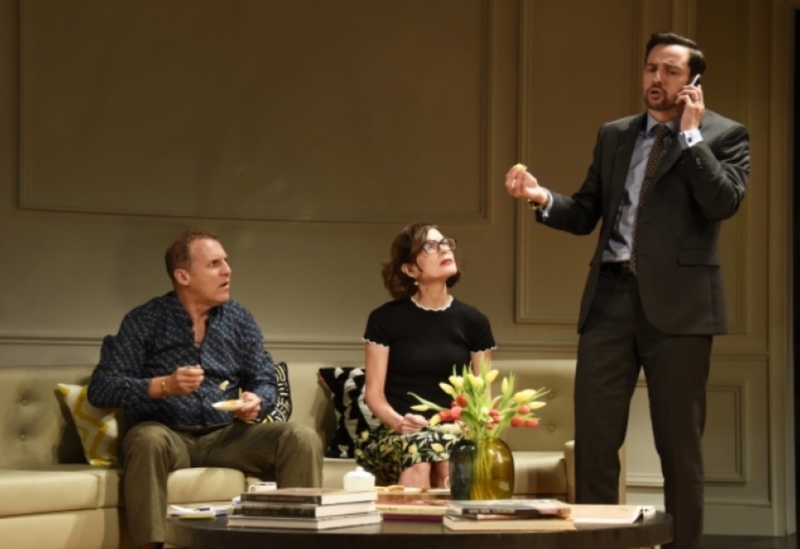 This production, with Lindsay Posner directing, goes for more comedy than the film. Seeing it all happening live is intrinsically funnier too. Comparison with the film version is inevitable. This play seemed shorter. It advertised 80 minutes with no interval, but that included the three curtain calls, and was still a couple of minutes short of eighty. I looked up the 2011 Polanski film, and was surprised to find that it was also eighty minutes, and presumably that includes the bookend exterior shots of the kids in Brooklyn. The interiors were all filmed in France due to Polanski still facing arrest in the USA. The film screenplay was by Yasmina Reza and Roman Polanski, with a different translator. All the character names are different, but Jodie Foster and John C. Reilly played the characters who are Veronica and Michael here, and Christoph Waltz and Kate Winslet played the visitors, who here are Annette and Alan. So that’s quite a competition. This cast triumph. They have no worries whatsoever on the comparison score. 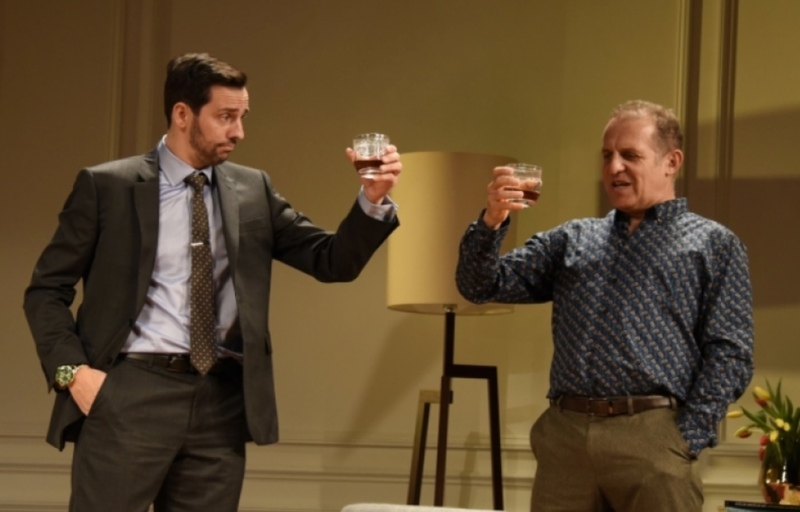 They are as good, and because live theatre is such a different thing, and because it was accented for more comedy, I enjoyed the stage version more. We don’t need bookending with kids. 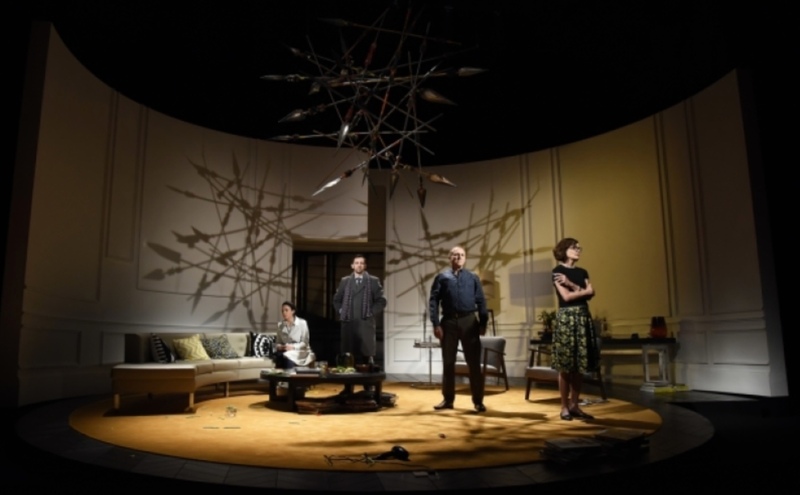 We open with all four in the sitting room of Veronica (Elizabeth McGovern) and Michael (Nigel Lindsay)’s home. Veronica is a writer and edits art histories. Michael runs a wholesale hardware business. Their son has been injured after being hit with a stick by the other couple’s son. The boy has lost two teeth. Veronica has summoned the parents of the assailant there. The parents are Alan (Ralf Little) a high-powered lawyer, and Annette (Amanda Abbington), who is in wealth management. Immediately we set up corporate types against solid wholesaler Michael and educated elité Veronica. I felt they gained an extra edge of comedy with accent. Michael is old-fashioned Londoner. Veronica is American. I hope it won’t offend my American readers, but her accents works so well at making her seem more PC, more concerned with bringing justice and resolution, but also in being more priggish and judgemental. As the family rows develop, it also allows Michael to imitate her accent to annoy. There are important plot flags. Alan, as a lawyer is concerned with wording. He won’t have his son described as “armed” with a stick. Veronica serves home-made aple and pear cake. A few minutes later, Annette has projectile vomiting. Brilliantly done – it went everywhere, so she must have had a hidden tube and pump. Fortunately it was only water. I said in my film review that I couldn’t see how it worked on stage … the film goes for the full peas, carrot and sweetcorn vomit. (Billy Connolly once pointed out that whatever you’ve eaten, vomit contains peas, carrot and sweetcorn). That precipitates the first crisis. I thought there was a point of divergence with the film. In the film, I thought the blame for the stomach upset was laid more heavily on Veronica’s cake. There’s an aside here, that’s all. Then there’s to and fro. Veronica’s son might not be the total innocent they think – he had a little gang. Michael loses credibility by having “murdered” his daughter’s hamster (if you want details, see it or the film). The running gag is Alan and his constant loud mobile phone conversations, which involve a company with a multi-million dollar value pharmaceutical drug. They have known for two years that it has dangerous side effects, and news is about to break. They all hear the conversations. Of course, Michael’s mum phones to say she’s just been prescribed it. We don’t hear her … we do in the film. The mobile phone business set me thinking. The loud mobile phone prat is really a decade ago. Hasn’t it been replaced by constant tapping of text messages? 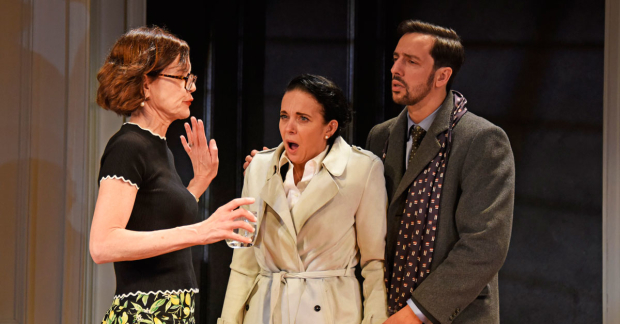 However, when Annette finally breaks (she’s had years of it) and gets rid of the phone, there was spontaneous loud applause right round the theatre … a great sign of an involved audience. After the phone loss, Alan is hilariously inconsolable, slumped in a chair, devastated. They all get into the rare Antiguan rum that Michael produces, they get drunk, and things go wild. We are into playground bullying and physical attacks which match those of the kids. Reviews say they get drunk extremely fast … too fast … as it’s all played in real time, but what else can you do on stage? Willing suspension of disbelief. Let’s just accept that they do. I’d add that 25% of a bottle of spirits for regular drinkers wouldn’t have them up and raging either. Michael cowers, Annette pukes, Alan restrains Veronica who is about to attack Michael! The curved set looks good. The heavily symbolic chandelier of crossed spears only gets lit to project on the walls at the end. An excellent cast, brilliant comedy direction.